Cristian Dohler Rodas has been described as an exciting, polished performer with a beautiful tone and clean even technique to match by audiences and judges alike. After teaching himself to play the flute when he was fifteen years old, he studied flute performance at Frostburg State University, with Keith Hanlon from 2014-16, where he enjoyed performing extensively in solo, chamber and large ensemble settings. While at FSU, Cristian formed the Augmented Second duo, with Susan Zoller. The duo gave their debut joint recital as sophomores in March of 2016, and presented a recital of flute duets and quartets, in collaboration with the io Ensemble (Keith Hanlon and Amara Guitry) at the 2017 Mid-Atlantic Flute Convention in Reston, Virginia. During the 2016-17 school year, Cristian studied with Dr. Carolyn Oh of Montgomery College, where he also performed with the MC Orchestra as principal flutist and soloist. Outside of school, he is an active freelancer performing in churches, with the Strathmore Children's Chorus of the Strathmore Music Center, and collaborating with local musicians on various recording projects. Cristian also plays regularly with the Prince George's Philharmonic, as a substitute and guest principal and is on sub lists for the Symphony of the Potomac, Columbia Orchestra and several other community orchestras in the D.C. area. 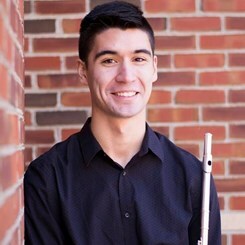 Cristian has performed for master classes with Nikolai Popov, Chris Norman, Valerie Coleman and Aaron Goldman; was featured in performances as part of the FSU Department of Music Honors Recital (2016) and Montgomery College Honors Recital (2017); and won first prize in the Flute Society of Washington's Collegiate Soloist Competition (2017). A dedicated proponent of new music, Cristian has performed two world premieres, and is enthusiastic about collaborations that will bring new and interesting works to audiences. Having several years of experience presenting master classes and clinics at the elementary, middle, and high school levels, plus one year of private teaching, Cristian believes that the best way to encourage young flutists to work towards a goal while still enjoying the instrument, is to give them realistic expectations and creative ways to reach them. Each student is evaluated in their first lesson regarding the level they are currently at, and what their short and long-term goals are. After that, a curriculum including daily technique and tone exercises plus repertoire assignments, is compiled according to their individual needs. First and foremost, the core of good flute playing is a solid technique and beautiful tone. That is why such an emphasis is placed on daily scale and long tone practice, to stay in shape and develop skills necessary to tackle repertoire later on. Weekly etudes are given to more advanced students to develop skills and sight reading, and as an exercise in being able to learn music quickly. While relatively demanding, Cristian does not believe that being hard on a student for not doing well on one particular element is productive. Instead, he approaches mistakes with the attitude of "How interesting! Let's figure out why that happened and see if we can find ways of breaking it down so that it doesn't happen again". That way, the student is able to accept that mistakes do happen, and that they're only a part of the learning process and nothing to be ashamed of. As long as you are willing to put in the work, everything will work itself out just fine. Cristian is currently pursuing a Bachelor of Music in flute performance at the University of Maryland, College Park with Dr. Sarah Frisof. He performs frequently with the UMD Symphony Orchestra, Wind Orchestra, Maryland Opera Studio, TEMPO New Music ensemble, and a wind quintet among other chamber groups. Request Lessons with Cristian Dohler Rodas today!